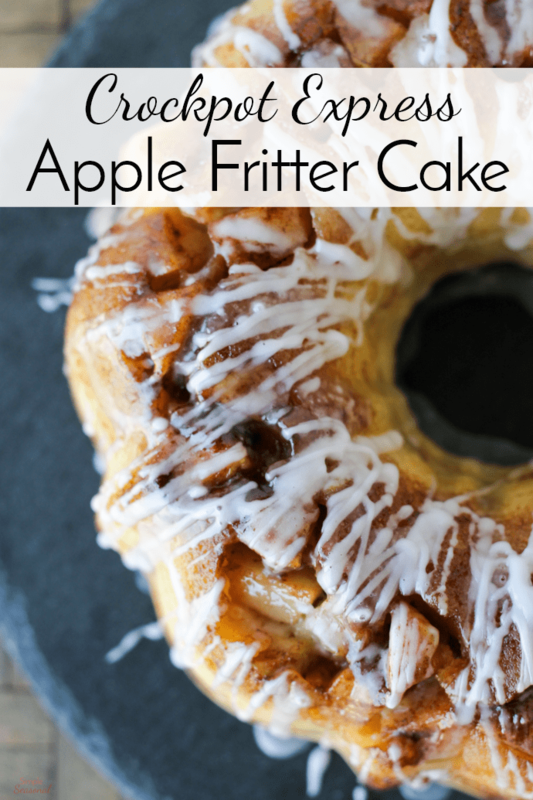 Good gracious this Crockpot Express Apple Fritter Cake is delicious! Just look at that crackly top and sweet glaze. 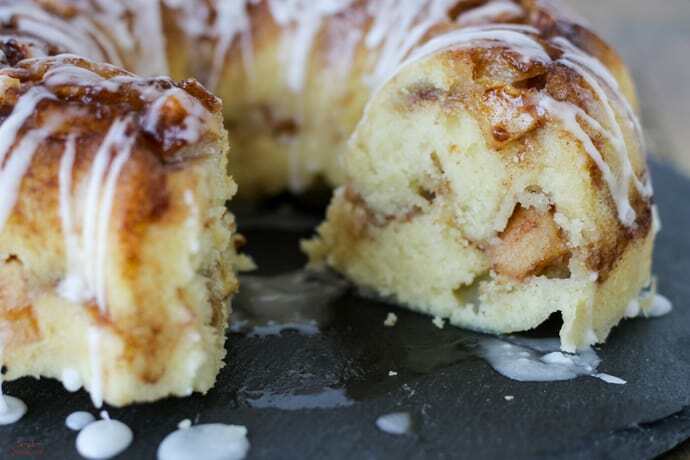 The apple chunks alone make this cake worth trying. I actually made four batches of this over the weekend and they are all gone already. My oldest son is going to camp this summer, and it’s quite expensive. Every year the youth group does several fundraisers for the kids, and this last weekend they did Comedy Night and a bake sale. I went searching Pinterest for ideas on what to bring for the bake sale. Quick breads usually sell quite well at bakes sales, and you can charge more for a whole loaf of something. I found this Apple Fritter Bread and made two loaves to sell. My house smelled so good! I had to make another loaf to keep. It’s really not a “loaf” so much as it is a cake, if we’re being honest. Which led me to think- I wonder if I can make this as a cake in my Crockpot Express? Guess what? I can. And it’s awesome. I made it both in the oven (in a loaf pan) and in my Crockpot Express in a Bundt pan. There’s hardly any difference between them, other than the cooking time. The CPE version is a little more close-textured and moist. The apples cooked through, the crackly finish on the top was there-it’s a perfect recipe for converting to the Crockpot Express! 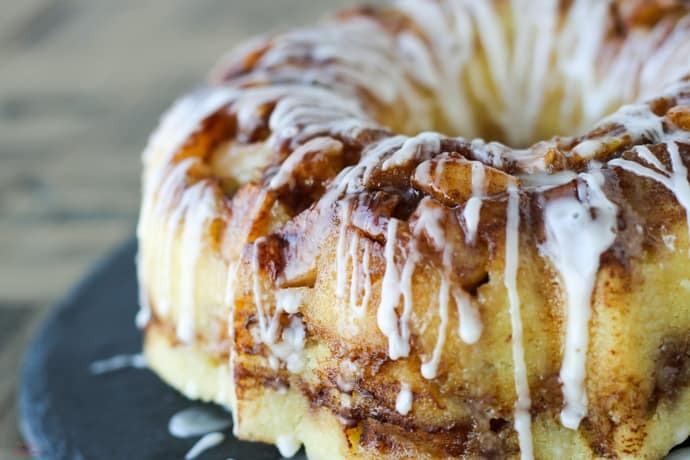 To make this Crockpot Express Apple Fritter Cake, the first thing you’re going to need is a good quality Bundt pan. I prefer Nordic Ware pans. 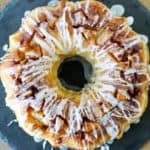 For the CPE, you need a 6 cup Bundt pan like this one. <—Click to see it on Amazon. Generously grease the pan, and then build the cake from the top down. 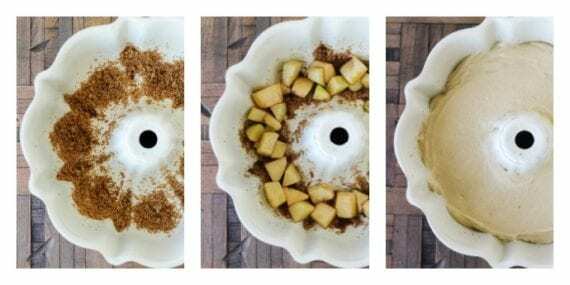 🙂 The brown sugar mixtures goes first, then the apples, and then the batter. You repeat the layers and then it’s ready to go into the Crockpot Express for cooking. Generously grease a 6 cup Bundt pan. In a small bowl, mix the brown sugar and cinnamon. Set aside. In a medium bowl, cream together the butter and sugar. Beat in the eggs one at a time and continue to mix. Add vanilla. In another bowl, whisk together the flour and baking powder. Add the dry mixture to the wet, and stir until blended. Sprinkle half of the brown sugar mixture into the bottom of the Bundt pan. Shake it a bit to get some of the sugar up the center post and on the sides of the pan as well. Add 1/2 of the apples on top of the brown sugar mixture. DO NOT STIR. Cover the apples with 1/2 of the cake batter, being sure to distribute it evenly around the pan and smooth it out. Repeat the layers. Cover the pan with foil. Place the trivet in the bottom of the Crockpot Express and pour in 1 cup of water. Using a sling, lower the pan onto the trivet. Close and lock the lid, and switch the steam release valve to the closed position. Press "Dessert" and set the time for 35 minutes (low pressure.) When the cooking time is up, do a quick pressure release and carefully remove the pan from the CPE with the sling. Let cool on a baking rack for at least 10 minutes. After cooling, flip the pan over onto a plate to remove the cake. Prepare the glaze and drizzle all over the top of the cake. Serve with vanilla ice cream for an extra dose of deliciousness! Seriously, I can’t even begin to tell you how delicious this is, especially when it’s still warm. It’s like a delicious donut in cake form. And the fact that you can make it in under an hour without heating up the kitchen? That’s GOLD. 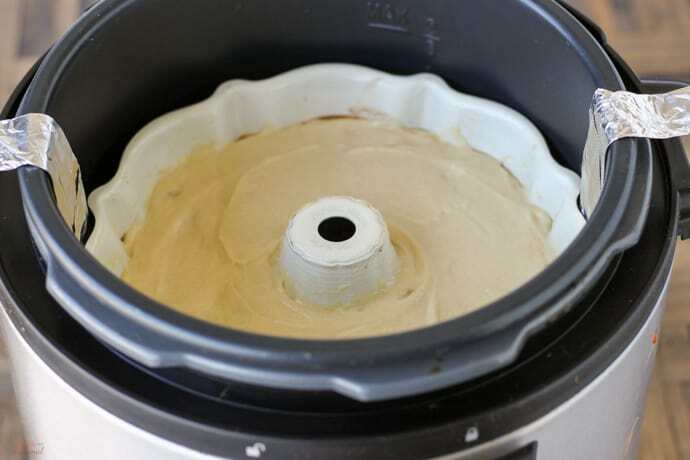 Click here for more great Crockpot Express Recipes like this one, or join our Crockpot Express Community on Facebook and get great recipes and ideas from other users. This sounds delicious. My crockpot isn’t round does that make a difference. I don’t know if they make oval trivets. Any ideas. I want to be clear- this is for a Crockpot Express Multi-Cooker, which is an electric pressure cooker. This recipe won’t work in a regular Crockpot/slow cooker. Well, I suppose it would, but it will take MUCH longer. 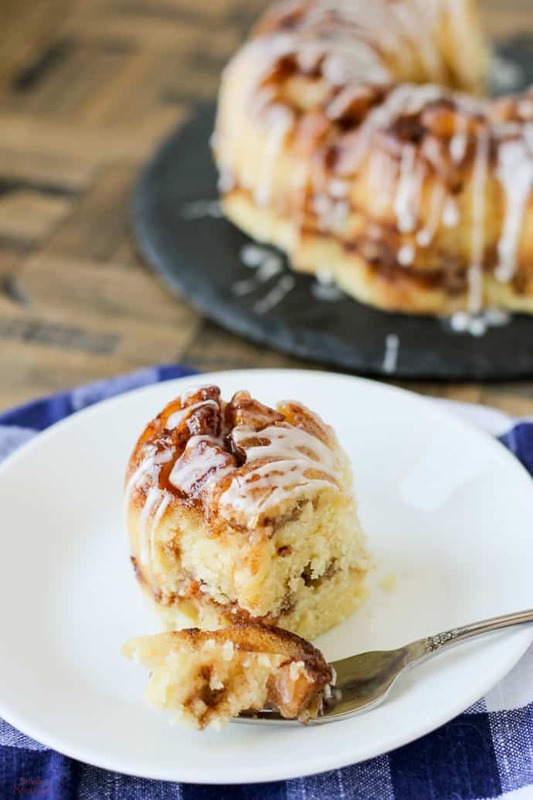 If you don’t have an Instant Pot, Crockpot Express or some other brand of electric pressure cooker, you can easily bake this in the oven instead! It takes an hour in a regular loaf pan.